Stamp a Sweet Impression: Arrrr... Party!! Hi All! I am so excited to share this project with you today. The other day I was making some paper hats and boats with my 3 year old son. He was really intrigued with the boat and and asked me to make him a bunch. Then, a light bulb idea came to mind. Wouldn't these be cute for a birthday party favor? Josh's birthday is in December so I have been thinking of themes lately. So, I headed over to the Internet to do more research and came across a Martha Stewart post with the same idea. (Of course she thinks of everything!) So, off I went to create my own version. I followed her instructions for the boat (mine was much simpler) and found out the hard way that you should use light weight paper. The boat will tear if you use heavy card stock. I filled the boat with some bone and skull candy from Mike's. 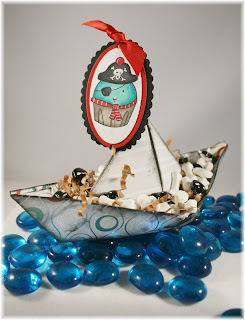 However, the main attraction in this project is the cute pirate cupcake from the SASI "Trick or Sweet" set. (I love how versatile it is.) He completes the whole birthday pirate ensemble. I colored him in with my Copics and used my oval nesties to frame him. I created the "sail" look by punching two holes in the oval die and running a bamboo skewer through it. I them punch a hole in the boat and stuck the whole thing in there. I also added tape in the inside to better secure the bamboo skewer. To complete the ensemble, I create a seating name card. I used my JustRite Monogram set to stamp the name "Jon". For the photo display, I used some large flower pebbles to mimic water. Also, if you don't want to make personalized pirate boats, you could also set up the main table with lots of pebbles down the middle. 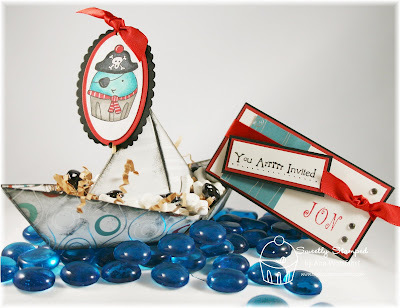 Then, you could place a few boats on top to create an adorable centerpiece. Well, I hope you've enjoyed my little blog post. Make sure to check back for more fabulous ideas from the Baker's Dozen. How freaking cute is that!?! oh my, how cute is this? love, love, love it. this would be perfect for a birthday card for a boy ...i think! LOL! What a GREAT project Ana! Super duper CUTE! What an adorable project, Ana!! Good heavens, girl, what an AWESOME project. You're incredibly talented!! This is ADORABLE!!! How creative you are!! Super cute idea! What little boy doesn't like a paper-boat? Love the colors! TFS!